.tk was once designated as the riskiest ccTLD. .ru is often said to be, after .com, the most used in the content of spam messages. But is there a ccTLD that is a favorite destination for copyright infringement? The question is worth asking in view of the growing trend for .com domain names seizures related to copyright infringement. If publishers of illegal content are afraid of being the next target of I.C.E. 's Operation in Our Sites, do they move to other namespaces (and if yes, which)? To try to have a view of ccTLDs 'favorited' by such websites, I used data Google recently published regarding copyright removals requests it receives. Though Google is the recipient of only a (small) part of notices sent by copyright owners, this data consists of millions of requests, which makes it an interesting database to play with. 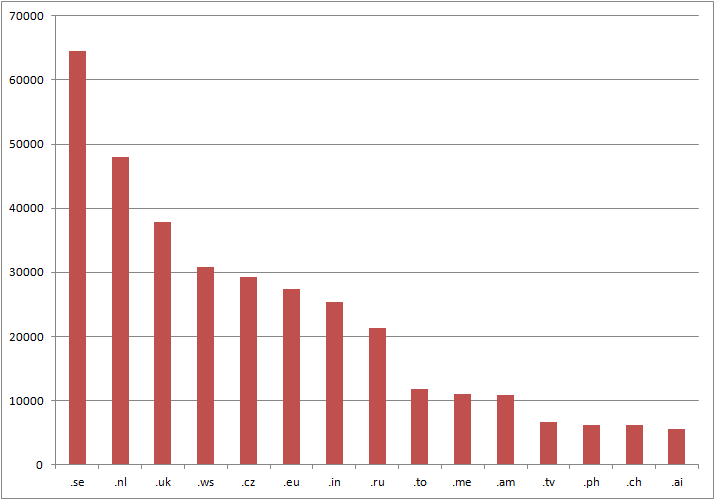 .se is the ccTLD where registrants are the most targeted by removal requests. ThePirateBay.se plays its part, as readers have guessed, but only for ~20% of the total (this domain is specified in 12739 requests). Beyond this example, the ranking may help fight against prejudices: There are, for example, less than 300 requests mentioning .cn names. In the case of at least one ccTLD, .ai, 99.99 of all requests relate to the same name (tz.ai accounts for 5657 out of 5659 requests). In the .ly space, famous for having suddenly blocked vb.ly used for adult content, there are only 5 names cited in the notices, among which one, adf.ly, is mentioned in 5125 requests out of 5150. The counting above remains of limited interest for the moment. It will be interesting to see, in one year for example, if there are significant changes and if they can be linked with domain seizures. Though they were limited to the .com space, these seizures have recently expanded to ccTLDs such as .uk, .eu, .be, .dk or .ro. 1 Note that the Me.Ga project, which remains unknown at the time of writing, cannot be said to be infringing copyright or any other law. 2 See Google disclaimer regarding the data here. I used Google Fusion Tables and removed two columns from the original file to get a lighter file one. I share the file here. How do you account for "cracked" or "hacked" sites? A lot of the phishing sites we see are subject to takedown notices on the basis of copyright infringement but only a very small number of them are actually set up by the domain holder or with their knowledge, so I don't see how these figures can be of any merit without accounting for this. I agree, Michele! Problem is that one doesn't know the part of those sites in the total. You write 'a lot' and it may be true! But can one assess if it's closer to 10 or to 90%? Absent such knowledge, I found interesting to make this list with the aim of updating it next year. Any help or figure welcome! We on the Transparency Report team at Google read with interest your article, Copyright Infringement and ccTLDs. Unfortunately we might have misled you on one point, which is that the urls.csv file (like the rest of our site) includes only those URLs that we took no action on. We don't make this fact very clear, and we're going to fix that. I'm not sure it affects the end result of your analysis, but I did want to point it out to you. A useful alternative might be to look at the "domains.csv" file, which gives per-domain totals for the number of URLs on which we did (or did not) take action. Thanks for using our data! Its author, Matt Braithwaite, allowed me to share it here. Wonder if we can have access to the referred "Domains.CSV" file. Local Time: Wednesday, April 24, 2019 08:57 PM PDT – Page Load: 0.4301 Sec.